Webex Teams is here to help you transform how work gets done, not just enable team chat. Webex Teams is an app for continuous teamwork that brings crystal-clear video meetings, group messaging, file sharing, calling and whiteboarding so your teams can work anytime, on any device, with anyone, across any workstream. Work for Cisco Webex Teams? Learning about Cisco Webex Teams? 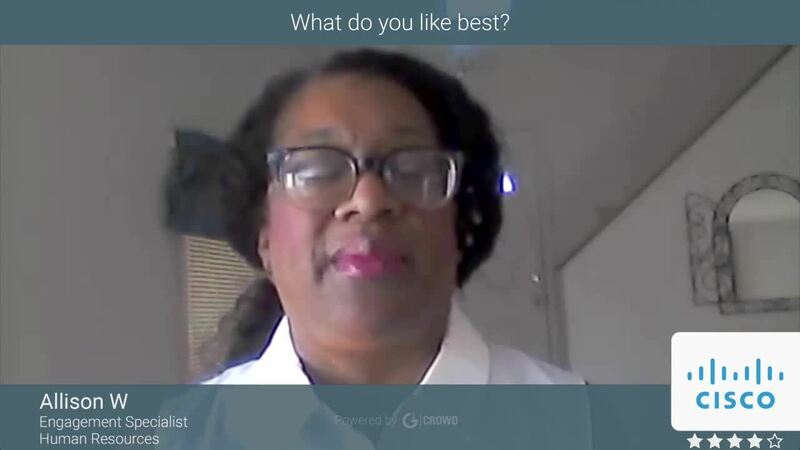 "Allows us to get a deeper level of collaboration in our meetings"
"It's easy to navigate and easy to move around the user interface"
Cisco Webex Teams provide various sets of web conferencing services. It means segmenting the experiences into several appropriate contexts. As a result, we can position solution offerings optimized for different use cases. At the same time, they maintain a common interface and intuitive features. Meeting Center, Training Center, and Event Center are the most important ones to use since they constantly break groups. This software is regularly updated and possesses great functionalities such as an awesome mobile app. Do not work with Verizon since its unreliability has caused us integration issues.between instant meetings and Webex sessions. Partner/Supplier relations and business process agility are greatly improved. The cost of the management has greatly decreased and internal/operational efficiencies have been created. The time to market has also been getting shorter and shorter. Communication is the success and Cisco Webex Teams is a great tool for teams to communicate and collaborate with each other in one place. All the updates are regularly shared with team so all remain updated. It is simple to install and get started. The interface is also very easy to use. The best thing it is free to use with all rich features and a good brand behind it. Sometimes it takes time to load the application and makes to wait. Train the users about the features of Cisco Webex Teams and then start implementation. A lot of confusions will be removed only by Training. We shifted all employees who do not have a paid solution for communication to Webex Teams. It has saved the cost and made communication a lot easier for all. Also it has reduced unnecessary emails between employees. "Works but Takes a Lot of Work!" We have multiple satellite offices. It is great to get all of your team in one place. This really helped us communicate and all be on the same page. We used to have a speaker phone type conference line. Sure it works, but nice to see everyone in one "place." We had an issue with set up (took months), and also getting everyone on board. Some times we have issues keeping everyone connected (folks log in and out), and calls versus a space versus a meeting and how many can be in each one...that was a big learning curve. Some days I still wonder what I am doing! I also at times simply want to create a "space," but if you walk in to our conference room, it automatically puts you in our "home" space and you have to get unconnected! Take the time to learn it! We have integration teams come out to help us, trial periods, and a lot of trial and error. Now we seem to be pretty seamless and as long as I can recall who I am calling and how to add folks to a "space," it works like a dream. Four satellite offices and small business keep our leadership team all on the same page. When we started hiring folks in other states, this gives us the option of relocation or keeping put (as needed). I love how easy it is to create spaces for multiple people to collaborate in WebEx teams. It's so easy to organize by topic or workstream and share files. The mobile app is great so I can stay connected on the go. It's a little difficult to tell how long it will take someone to respond. It could be instantly like an IM, or it could take them several days to get back to you. Overly communication how this can transform workflow and collaboration. This is a huge value that a lot of people miss because it's more than just an instant messaging tool. We have increased collaboration between different groups and removed unnecessary email back-and-forth! "A cloud hud between different word"
Cisco Webex teams allowed us to efficiently communicate with our clients across multiple time zones to complete a large program in several markets. Along with the ability to message each other we also utilized the document sharing feature. We also liked the ability to look back through the conversations to review what we aligned to throughout the project. I don't have any major dislikes of the system overall. the only thing I can really think of is that I never felt like I knew where I was in the system. What I mean by this is that I was unsure if I was in the Chat feature of where to go to find some items. An increased user experience with system navigation would go a long way in providing a better customer experience. I would recommend this to companies that work with clients that have restrictions to their firewall. This is the main reason we use this system on a case by case basis. I would be interested in the future in exploring the integration features but it was not used on the project we most recently worked on. I would give this system a shot and at least demo it because it is backed by a industry recognized name. We were working on a single project with a client so overall we were not trying to solve an specific business objectives. We were required to use that system by our client because it was an approved system within there IT service. Ultimately it did help us be more agile in the feedback process with that client, more so than email ever did. When i got up in the morning I was able to check it and provide feedback quickly. That the experience is different with meetings in Webex Teams VS traditional Webex. I don't like that when I join a Webex with Teams that if someone tries to chat with me that I don't see that chat come through. I also don't like how the whiteboarding experience in Teams is different in Webex. Both meetings should support the same, number of participants, chat, white boarding, moderator controls, polls, etc. Just try it. Be consistent. Use it for all of your interactions with your coworkers, customers, business partners and even family. Able to communicate with coworkers and customers in a single space and use the collaboration tools. We are able to bring in our Project Manager, lead engineer, supporting engineers, account manager, solutions architect and the appropriate customer resources into a single Space or Team to be able to collaborate on a solution we are deploying. The benefits to having everything you need in a single application is huge. The customers we've used it with, even if they don't have teams deployed in their own organization, love the fact that they can send a message to a Space and get an answer quickly. They can tell that we've seen the message and that we are in the process of responding. This also helps when they have a question or an issue and they are not exactly sure who to ask, allowing for quicker resolution and better customer experience. "Ease-of-use + Simple UI + Features"
LOVE the integration with my Outlook calendar. The fact that I can book a meeting in Outlook and simply add "@webex" to the location line is great. All of the work is done behind the scenes. 1. I wish that I could hold much larger meetings (i.e. the size of company-wide All Hands). Collaboration + speed and ease of communication. It has been instrumental in getting us out of email, which in turn has sped up dialogue response times greatly. "Great way to work/collaborate with out of state team"
"Best collaboration tool for internal teams and prospects"
The call me feature in the premium version is best for users who are having clients throughout the world. Newly engineered app and UI is good and more customizable. Some common features like private chat, audio video, and options to pause/resume screen worked effortlessly. I never had any problem using this platform. The only concern is it freezes at some point in time while joining the meeting else it's a good tool. The best tool for large enterprises as well as mid-size to meeting and do the sync up calls daily. The most important is team collaboration across the globe. Meetings with prospects and record meetings for future reference. Mobile app to join quickly. The simplicity of Cisco Webex Teams makes it run smoothly with my team! It works perfectly for my team and our weekly meeting! As we use it only for work it doesn’t get messy with other social apps and with SMS and different phone carriers not everyone for messages so Cisco saves is greatly with the straight forward interface. Not all m contacts uploaded of there was no email address attached so that was a tad tedious. "Take your meetings to the next level "
It is ideal for working with colleagues who are not directly in the office, keeps you linked and in constant collaboration, is made to work in teams, the work flows in all its processes because the communication is accurate, and can do from video conferencing, to communicate by chat, you have different channels all of good quality in video. The details I have had regarding some functionalities have been more part of the initial ignorance of the platform and not of the platform itself. It has made communication much more fluid and unlimited to different channels, that has allowed the information to arrive in a timely manner to solve problems and to advance in the resolution of problems in the distribution and use of our public goods. It's very current technology and once we understand it better will be very helpful to our company. You can use it on several platforms and we have also purchased their monitors which integrates the product even more within our company. I think it's fairly complicated out of the box. We are learning it though. I wish they would have provided some onsite training for us but I'm not sure if that was an option. You need to do your homework and research the ways that the product works. Communicating with our branch in Poland. We have it implemented there as well so we can communicate with them effectively. It is also a benefit to our sales staff as they can use it to communicate with intentional clients. "It's An Underwhelming Business Chat Tool"
I like the global text search feature. However, it's not saying a lot because every other chat tool has it. Everything. It has got to be one of the most unintuitive chat tools out there. - If you are in the middle of a conversation with an individual and need to pull in ONE other person into your chat, you HAVE to create a new space (group chat) that requires you to create a new title for the group and add all the members involved. This causes so many headaches as the vast majority of these kinds of chats are one-offs so requiring us to go through a new space setup everything is frustrating. - Expanding on what happens after you create spaces above, you cannot delete them! Mind-boggling, really. Your tool is inundated with dozens, if not it could reach hundreds over time, of chat groups that you will never use again. - New chat messages (or unread messages) doesn' automatically sticky at the top of your chat menu. So you have to scroll down to find them. - There is no "reaction" buttons for messages. So in response to that, when someone shares a great idea, instead of "liking" a message, everyone sends thumbs-up emoji. Those are just a few of what's most frustrating although there are many more frustrating quirks that exist in this tool. Save yourself the headache and get a better tool. Team chat to help improve team collaboration and internal updates/messaging. Improve team collaboration and internal communication. "WebEx Teams - still needs some improvements"
Love that it stores files and makes it easier to collaborate with colleagues, customers, and vendors. You can save files to the space. Plus have multiple spaces for the same team which helps when there are breakout tasks or items that need specific files. Some key features are missing that Jabber used to have such as dnd; or letting people know you are on a call or away. You also can't share screens unless you are in a meeting which can be a problem if you are having some collaboration on something quick. I don't like that you can't organize the files; they are just "floating" and can't be arranged in an order. Learn as much as you can about the functionality and tips and tricks! Easier for collaboration real time, building teams within the company and with others outside the company to help with projects. Cisco Spark has made it easy to setup teams and collaborate via chat, audio and video. Spark is an easy to use feature rich application that is changing the way the business world communicates. Additional management of teams and spaces is needed. Admins do not have the ability to see who has access to teams for spaces. Licensing models can be difficult to understand. Cisco Spark is the perfect companion to an existing Cisco UCM environment. Being able to communicate in and out of the office is a must. We also need to be able to communicate with our field works. Spark has provided the platform for anyone on any device anywhere to communicate with others. "Best collaboration and telecommunication App I have ever used"
The best parts of Cisco Spark are: Call Quality, Ease of Use, Number of Functions, Seemless Integration with IP phones. We do not have any complaints. Despite our hesitation to move away from what we know and love, we decided to switch to Spark and we really like it. Switch now, do not wait. I have not found any negatives and our collaboration is better than ever before. We are just so excited to introduce more Cisco solutions to our portfolio. My company has been using Skype in its many forms for the last 10 years. Skype is great for connecting to people across the world because of is ubiquitous use in every country. It is considered the standard by most companies and organizations. However, it is known for bad call quality, having a lack of features, no integration with standard IP phones and no integration between Skype users and Skype for Business users. I work in my company HQ and one of my team members works remotely in Mexico. We had been using Skype for 2 years to talk to him over an IPad but we became frustrated by the lack of noise canceling and inconsistent call quality. Enter Cisco Spark. We hired a new IT manager and he suggested that we move everything over to Cisco, our phones, our collaboration platform and our server equipment. So far we have just swapped our phones and collaboration platform (Spark). Our calls have never been more clear and the noise canceling is significantly better. Additionally, we are able to use the whiteboard feature to virtually mark up documents and share visuals like we never could before. It has been an excellent switch. We just wish we would have done it sooner. "Love it use it every day"
I love how easy this is to use and able to message outside our work network if users have teams. Communications. If you need to do a quick call you simply press one button. Same with chat. You can also create groups in which one user can start a call and others join in. then you let in other that are not in the group with a click of a button. "Good but Other apps like it"
I really liked the ease of use especially when connecting with speakers at Cisco Live. I have used this also to collaborate with fellow engineers I work along with. This app does make screen sharing easy to use. The fact that it's one among many, really there are other "collaboration" apps out there like slack. I have only used it a handful of times due to the lack of adoption by my colleagues. Also a quick statement about this is that it's UI seems to be lacking, I often find my self searching for buttons, that lack any identifiable characteristics / tool tips. I am not completely sure we're solving any problems, like i stated we're not able to use it because of the lack of adoption. "Simple and Powerful tool for collaboration"
Easy to use and user management, I like this design because I dont have to worry about random txt messages. The only thing I can think is a dislike would be centralized note capability. I love the ease of use, that I can make calls with my team through Spark, that I can share files. I love that I can reach any of my team members at a moments notice and that I can keep in touch with all my team even when I am remote. It is a great team and rapport builder, especially with teams that are remote from each other! I love that it also has a mobile app, so I am never far from my team. I really have nothing that I do not like about the Spark application, I would recomment it to everyone at the drop of a hat! The busines problems I am solving with Spark is the lack of quick and easy communication between coworkers. "Falls somewhere between Skype for Business and Slack"
I previously worked at a company that used Slack, and moved to a company that used Skype. We recently switched from Skype to Cisco Spark. Spark seems more collaborative than Skype, and I like the searching functionality along with the option to view conversation history. Compared to Slack, the Bots in Spark seem pretty limited in their ability. This may seem minor, but having the ability to send GIFs in a group conversation is a great feature. Spark's current GIF bot will send a totally random GIF when you type in a word or phrase, which can be awkward if it's not what you're looking for. Also, in the transition time of phasing out Skype and phasing in Spark, I've found that my team usually had better luck with Skype meetings than Cisco WebEx meetings. Switching to Spark and WebEx permanently, I feel like we've lost some of the meeting functionality that we valued with Skype. Besides collaboration and web conferencing, I like that Spark saves your conversation history in a way that's easily accessible. With Skype for Business, I was frustrated when I would have to restart my computer and lose old conversations that sometimes had important links or documents attached. Skype has a way to view conversation history, but it's not very user friendly and it was kind of all over the place. It wasn't a log of all conversations to date, so it seemed pretty fragmented. I think Spark offers benefits here. really think about if you need meeting agendas and notes in a different place than your project management. it's great because you can automate meeting agenda process, but only if you in fact use these agendas and follow ups. it's cool because you can see the team typing and putting in discussion items during the meetings. The UI of this tool is fabulous and user friendly. The most important thing is we can save our chat conversation in it. The only thing that needs to improve is to link the chat history with the email address to the users who had a chat over there. As its very simple and user friendly IM tool which helps the corporate employees to have a very quick and, time saving chat within their organization. "Connecting People with Proper Security"
For instinctive application and suitable environment for the users, I like Cisco Spark very much. It gives me proper privacy when I use this software. I can do Video call, Screen Sharing, Upload files etc. with this application. The best advantage this software can provide me is to delete any message and whether I add any person into the user room who is not currently using the in the Cisco spark, they will be notified by email to sign up to the Cisco Spark. I find using Cisco Spark very beneficial and user friendly, but some limitation of this application bothers me very much. Like, I cannot share screen without doing the video calls. Also, no audio call be done without doing the video call. For its security and user friendly specialty, I would recommend to use the Cisco Spark. Because it can give you a nice and helpful progress of your work and increase the spirit within the group works as well. I need to sit with a huge numbers of my clients and staffs face to face throughout my whole day. This software helps me conquering the distance and saves my time. My efficiency of work has increased a lot. It provides me proper use of time. "Good tool to collaborate online without boundaries!" Login online from any network, without any boundaries and limitations. There are no company VPN dependencies based on subscription from Cisco for his solution (with Cisco Spark Call). I can make a one-to-one user video call or also start a video conference with 3 member video call. Best feature for collaboration is ability to dial SIP conference bridges and SIP video endpoints. The audio and video qualities are very good and chat / IM to users. There is also additional provision of Cisco Webex included . Good tool to use for remote users and In-office users. "The way team collaboration should happen"
I love that I can interact via voice, video, chat and content sharing with my customer base without the need to switch to another login. There are so many things to like about the interface and its capabilities. 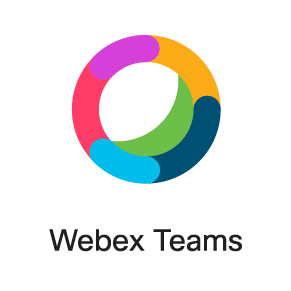 I use WebEx Teams every day to stay in touch with my team and customers, to silo information and have a single window for all of my team collaboration needs. There isn't much to dislike, the only thing I'd change is having messages retry when they fail due to connection problems. I don't want to have to manually initiate a retry. Conversations are organized and there's a place for every topic. this is a difficult one to answer. it works sometimes. we use it for simple collaborative communication across teams and within teams. we also use it for daily updates on the work the team is doing at any given time. it's not reliable, doesn't have great features. they need to spend time on hardening and look at the features of slack. just do what slack is doing as they already have this space figured out. We use if for things like team communication, collaboration, daily updates, live ops communication, request submits, and questions and answers with customers. We also use it for some web conference features and screen share. Sharing work across multiple teams and working within our team has also been a use case that we have been leveraging across the org. "Productivity, simplicity and teamwork tool"
Cisco Webex Teams is a tool that provides messaging, meeting, and calling. One of its features is called teams. A team is a collection of users working on a shared goal. Each team has spaces where users can chat, share files, and have meetings. Any team member can join or leave any space in the team at any time. Cisco WebEx Teams has some functionalities that were missing in Cisco Spark. Some popular browser are not supported yet. The main business problems that I am solving are to manage the projects with my team and to share relevant information. I realized that the productivity has increased and I receive an instant feedback from stakeholders. "A best place to get work done together"
Cisco spark has changed the concept of team messaging and communication in a very dramatic way. Messaging, meeting and deliver calling are now so easy from this cloud. This app also ensures security of the users by providing an encrypted and feasible chance for enterprise wide engagement. The best part I like that I can communicate with team members easily and also could have private chats outside the main room. Users can share content in a meeting, when in a call, or when messaging anyone, and the app can be accessed on smart phones, browsers, and dedicated downloads on Windows or Mac desktops. Though it’s a nice app to work with but it has downsides too. It’s not so much user friendly and sometimes users cannot use voice recognition to send a massage. Sometimes massages won’t send, icons sometimes won’t load and that things really disappoint a user. They should work on to solve this as soon as possible. It can be consider as a necessary tool for remote users and In-office users. I would recommend people to use it as it guarantees high security and it simplify your work tools and manage everything from one place . By using this platform I can save my business time and can invest my time to planning another thing. I can easily chat with other members without any hassle and can share files, documents in a very short time. It is accessible from any place or any device and can easily integrate with other tools and applications. "Simple to use and helpful"
I like how simple Webex Teams is. We use it to communicate with over a dozen locations and it helps keep all the conversations organized. There is a calendar and phone feature but we never use those parts of it. The scaling for different sized screens is not very good. I would prefer to have it be permanently narrow on the edge of my screen but it doesn't do well when the windows is taller than wider. Other than that it has worked really well. It works best if you can use it with a lot of different people in different locations. We use it to communicate with several different locations. The organization of it is perfect so that we can have a channel for each location, a support channel and a general one. Simply, emailing each other would be so much worse. It's easy to see if multiple locations are having similar issues. Is a platform that allows you to communicate to other people in a group setting. A better way to conference call. Participants can mute themselves or the conversation, and can be designated with the put in their opinion. The data system can be a little janky. There have been times where the connection was poor and the conference call couldn't be taken place. I would recommend this product. It is good for video conferencing and team collaboration. Can be used through the app or online. Effective communication and protocol amongst business and for educational purposes. Good for socratic seminars and create a discussion between teachers and students. "I Love Webex Teams! " It's super easy to use, the company let it grow organically and it happened fast. It's great for collaboration on projects or within teams. We have a lot of fun on here as well! There is nothing in regards to the functionality that I don't like. It's a great product. Internal communication, especially between multiple office locations in the country, communication for project teams, and company-wide communication. It is a super simple and easy product for the employee to pickup and use. We have found the system lacks a majority of features that we thought were standard and are available in most free pbx systems. The reporting only works half the time and the data it gives when it works has to be ran through excel macros before it becomes usable. Either go to another product or wait to see if this product continues. It is seriously lacking in the administrative department and can not give any usable metrics. I love that I can attend webinars for subject matter in my field without the cost of flying across the country and attending multiple conferences throughout the year. I also use it when I need to contact clients for follow up items. I work remotely from my main office, so having access via webex allows me to do one on ones with my office and/ our clients as needed. "Internal and external communications "
Support team want to resolve the tickets as soon as possible. "Impressive application for day to day collaboration with dispersed teams"
We are a heavy Webex shop, both Teams and Events. I also manage employees across many different time zones. The escalation from text/chat to video calls is seamless and very useful. It's also handy for joining scheduled Webex meetings from Teams with a single click. I sometime find it difficult to remember whether something I need is in Teams or in email. Ideally Teams would replace email, but it just isn't our reality. Thankfully, the search functionality of Teams is very useful. Cisco Spark is becoming increasingly valuable for me as it integrates with the various communication platforms that I work with every day. I dislike the fact that it's consistently popping up and asking me to interact with it before I had configured it to do anything. Having one platform to unite communication between teams and keep their upcoming events in view is difficult. Cisco Spark helps make that problem a little easier. The ability to quickly join critical stakeholders into a single platform for chat, voice and video. The calling experience and space management. The calling experience has a roadmap to improvement, but the space management pieces continue to be a barrier to long-term adoption sustainment.. The ability to quickly and effectively communicate both within and outside of my organization as a means to get work done. Webex Teams enables me to provide the best customer service to my internal and external clients through effective collaboration. It allows me to collaborate with external parties with easy. Also, it's great as a quick option for video. We also use it for war rooms, that allow us to bring people outside the war room up to speed as soon as they join. Improve the simplicty of navigating between people and spaces. Use it to jump between mutiple book meetings. Webex teams has truly changed the way we work and communicate internally in our organization and with our customers. The piece we like the most is how easy it is to enagege and collaborate with our customers and business partners without the need to do Federation. Basically Cisco spark is a new way of communicating inside and outside of the corp. The concept of messaging and communication much easier and you can bring back document from meeting and access them from wherever. It will change the way people interact within enterprises and corp, where users can share content when on the phone or in a meeting. It can be accessed on all devices, smart phones, PC. Try it, it will simplify many things, which you´ve probably hope for a while. The best thing is that I can easily can share files, documents and it is accessible. It has SIP and can easily integrate with other tools and applications. "WebEx Teams leads the way"
No threaded conversation in the group chat. We can actually start meetings on time ! Tightly combining the hardware and software allowed for a unified experience. The ability to simplify using a conference room was the key to staring on time. I enjoy that WebEx allows me to connect with my colleagues all over the world. It is a wonderful platform where you can share your screen and host meetings virtually with just a quick email. Overall, I don't have many complains with WebEx. I would like to receive more updates in terms of when the WebEx solution is enhanced or when changes are made to the software! WebEx allows for a much smoother communication process, unlike email does! "1:1 and Team Collaboration at the Speed of Business"
Working with different groups around the office or the globe requires a consistent way to work on projects, tasks and general business units operations. Webex Teams provides a great way to organize a thought thread and escalate to quick meetings or expand into a group meeting in a thoughtful and fast manner. Need more integration into third party SaaS tools that will provide unique messaging solutions and not links. Single messaging platform to host chat, 1:1 and group meetings. "Automate your action with this tool !!" I have utilized the full benefits of this tool so no complain so far! i like the way it integrates with my outlook and my webex meetings easily. When I am on the go, it is very easy to pull up and start a meeting with a client. for teams, i do not like the soft phones features on it today. I prefer to turn it off due to the quality of the phones not being as good. on the go meetings. Functionality and ease of use are huge benefits for me. "A good inter office chat option"
We use this as a replacement for AIM. We have a small office and we sometimes like to chat with each other about projects without having to jump on the phone or walk down the hall. This program definitely solves that problem. I don't really have any complaints about this program. It meets our basic needs and is also an improvement over AIM as we can easily share different kinds of files other than just jpegs. I would recommend doing the trial and making sure this communication tool fits your specific needs. We are able to communicate within the office efficiently. * We monitor all Cisco Webex Teams reviews to prevent fraudulent reviews and keep review quality high. We do not post reviews by company employees or direct competitors. Validated reviews require the user to submit a screenshot of the product containing their user ID, in order to verify a user is an actual user of the product. Hi there! 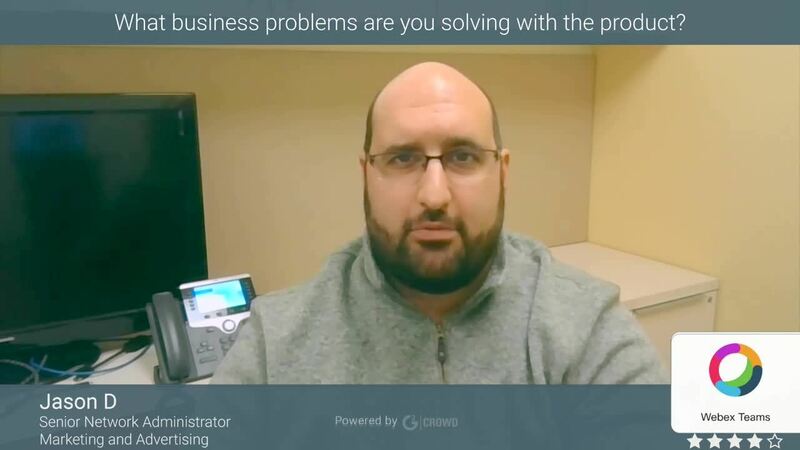 Are you looking to implement a solution like Cisco Webex Teams?